The controller of BBC One has insisted he is not planning to resign over the Queen documentary blunder. Peter Fincham spoke out after he allowed journalists to see a television trailer which appeared to show the Queen storming out of a photo shoot. He said showing the footage, which had misrepresented the sequence of events, was a regrettable "human error". The BBC apologised to the Queen, but Mr Fincham said he did not think he should resign and no-one had suggested that. "It is a mistake that was made for which, as director of the channel, I take responsibility," he said. "If somebody above me - the director general of the BBC Mark Thompson - comes and says 'you should resign', then I will of course resign. "But... I think that's disproportionate and I hope this is something we can move on from." He added that he had been sent a message of support by Mr Thompson. Mr Fincham had told journalists at a media launch of the BBC One autumn schedule on Wednesday that the trailer showed the Queen "walking out in a huff" from a photo shoot. However, he later said he had had no idea it had been edited out of sequence by production company RDF Media. The BBC Trust has demanded an explanation from Mr Thompson. Michael Grade, a former controller of BBC One and now head of ITV, told BBC Radio 4's Today programme that he felt sorry for the BBC and all broadcasters were "vulnerable". Blaming "young, untrained" television workers, he said: "Kids don't understand that you do not cut corners. You don't lie to audiences under any circumstances. "The people who make programmes just don't understand that the basic ethic of broadcasting in this country is trust." The programme trailer showed the Queen in an exchange with photographer Annie Leibovitz, followed by a clip of her apparently walking off. The footage was a trailer for a documentary, A Year With The Queen, to be shown later this year. 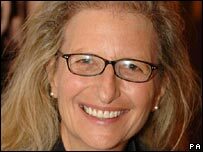 "The BBC would like to apologise to both the Queen and Annie Leibovitz for any upset this may have caused," the corporation said in a statement on Thursday. Later, a joint statement from the BBC and RDF said the footage had been supplied by RDF and the BBC had had no idea it had been edited out of sequence. "This assembly was never intended to be seen by the public or the press," it said. "Unfortunately, this assembly was given in error to the BBC personnel who were preparing the BBC One autumn launch tape." RDF Media, which also apologised to the Queen and the photographer, said Mr Fincham had used the sequence "in good faith" and had no knowledge that an error had been made. Does no-one in production sit down to watch an evening's telly? Photographer Annie Leibovitz is seen in the trailer telling the Queen she will look better without her tiara because "the Garter robe is so..."
Before she can say anything else, the Queen replies, pointing to what she is wearing: "Less dressy. What do you think this is?" The clip then cuts to the Queen walking through Buckingham Palace saying to her lady-in-waiting "I'm not changing anything. I've had enough dressing like this, thank you very much", implying she had stormed off from the portrait session. But in fact, this clip was filmed before the exchange over the tiara. 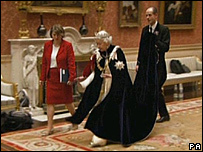 Stories describing what appeared to be the Queen walking out subsequently appeared widely in the media, including on the BBC News website. Her Majesty had posed for Ms Leibovitz in March for a series of portraits to mark her state visit to the US. Four official portraits of the Queen have since been released by the photographer. The incident comes in the same week the BBC was fined £50,000 after the results of a Blue Peter competition were faked last November.